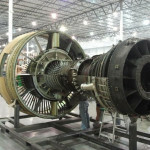 Certification testing is underway on the first Passport development engine at GE Aviation’s Peebles Testing Operation in Ohio. The engine began ground testing on June 24 and ran for more than three hours, reaching more than 18,000 lbs. of standard day sea-level takeoff thrust. Eight Passport engines and one core will be involved in the engine certification program. Flight testing on GE’s flying testbed is scheduled for 2014. Engine certification is expected in 2015. The Passport engine certification program follows three years of validation testing. GE Aviation has conducted validation tests on the fan blisk design, including two fan blade-out rig tests, ingestion tests and a fan aero rig test to demonstrate fan efficiency. Testing is complete on the third eCore demonstrator, and GE has accumulated more than 300 hours of testing on eCore demonstrators to date. GE’s Passport engine is the result of a joint venture between GE, IHI of Japan and TechSpace Aero of Belgium. The Passport engine for the Bombardier* Global* 7000* and Global 8000* business jets will produce 16,500 pounds of thrust and will incorporate advanced technologies and materials to provide: 8% lower specific fuel consumption than engines in its class; margin to CAEP/6 emissions and to Stage 4 noise regulations; and world-class reliability and support. 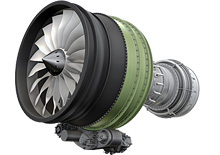 Among the new engine technologies are a composite fan case to reduce weight; a unique 52-inch front fan blisk for lower cabin noise and vibration, technologies from GE’s eCore suite to lower emissions and improve fuel efficiency, and a unique super finish on the high pressure compressor blades and blisks for enhanced fuel efficiency. The Passport’s integrated propulsion system from Nexcelle, a joint venture between GE and Safran, will feature a slim-line nacelle with outward opening cowl to reduce weight and drag while allowing for easy maintenance access and high dispatch availability.